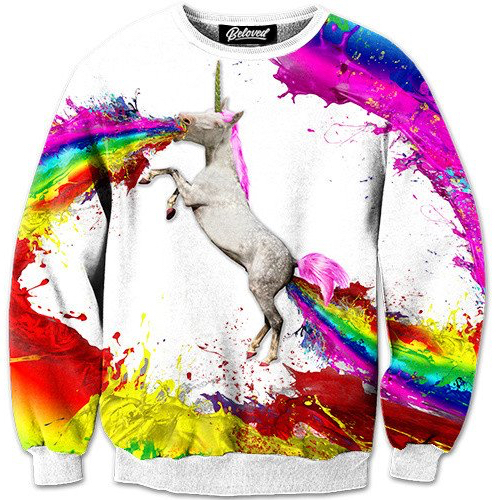 Make a fashion statement in the newest and trendiest sweatshirt- The Unicorn Spewing Rainbows! Heads will surely turn as you step out in this colorful number. Made of 95% polyester and 5% spandex, this sweatshirt is perfect for taking walks on chilly autumn days, cuddling up with your sweetheart, or celebrating the holidays with family. Details include a fashionable crewneck design and a graphic image of a unicorn expelling rainbows from “both ends”. Use the code "WEIRDSHITYOUCANBUY" at checkout to get 10% off!